Differing theories and contradicting stories concerning the events that took place after the mutineers arrived at Pitcairn, have been told. Whether any of these stories were offered as a deliberate attempt to disguise the truth, especially the whereabouts and fate of Fletcher Christian, is again uncertain. Over 2,000 books and articles have been written, and no fewer than five major movie productions have been made about the most famous mutiny. Upon arrival at Pitcairn Island in January 1790, the crew of Bounty discovered the island had previously been inhabited. Many relics of a Polynesian civilization were found scattered around the island. Roughly hewn stone gods, which guarded sacred sites, representations of animals and men carved into cliff faces, burial sites yielding human skeletons, and earth ovens, stone adzes, gouges and other artefacts of Polynesian workmanship were discovered. The stone gods were deliberately destroyed when pushed off cliffs into the sea, and although many stone adzes have been given away or removes, some are still being found today. The carved pictures in the cliff faces can still be seen at such sites as Down the Gods and Down Rope. The origin and subsequent destination of the Polynesian seafarers remains uncertain, although it is generally believed that they arrived from Mangareva, some 490 km away in French Polynesia. . . . . we discovered land to the northward of us. Upon approaching it the next day (Friday, 3 July), it appeared like a great rock rising from the sea. . . and it having been discovered by a young gentleman, son of Major Pitcairn of the Marines, we called it Pitcairns Island. These words, recorded in Captain Philip Carterets log, describe the first sighting and naming of Pitcairn. Due to the surf, which at this season broke upon it with great violence the Captain, of HMS Swallow, was unable to land. Not having a chronometer aboard, Carteret miscalculated the islands position by 3 degrees 24 minutes and thus marked Pitcairns Island 188.4 nautical miles west of its true location. No one except the determined Captain Cook was interested in Carterets report and his search for the island was deflected by an outbreak of scurvy. Eventually, once found again, Pitcairn might have become just a casual stopover for whalers looking for land and fresh food. But its destiny was to be quite different. The tale of the mutiny of His Majestys Armed Vessel Bounty is well known. A coastal trader named Bethia was refitted and re-christened as Bounty for a voyage to collect breadfruit tree seedlings to take to the West Indies for cultivation as food for slaves. On 23 December 1787 Bounty, under the command of William Bligh, left Spithead for the English Channel. On 26 October 1788, after a difficult voyage, Bounty finally arrived off Tahiti. It was to be another five months before Bounty would set sail. During this time, the crew had spent some time ashore and when the time came to return to England, some were already contemplating staying on the island. On 28 April 1789, three weeks after leaving Tahiti, Fletcher Christian and some of the ships crew mutinied, setting Bligh and 18 of his loyal crew adrift in an open boat. Most of the remaining crew on Bounty wanted to return to Tahiti, but Fletcher Christian knew that in time a British naval ship would come in search for them and Tahiti would be the most likely place to start looking. Intent on finding a new home, the crew arrived off Tubuai in late May. Even though the natives were unfriendly and there was a lack of livestock, Bounty sailed to Tahiti, returning to Tubuai with livestock and some Polynesians to help them establish a community there. Almost three months later, continuing conflict caused Christian to abandon this settlement and again return to Tahiti. Today there are still remains of the earth fortress they built over two centuries ago. In September 1789, 16 of the crew voted to remain in Tahiti. Eight of the mutineers decided to stay with Christian and continue the search for an uninhabited island, hidden from the outside world. During the night, Fletcher Christian learned of a plot to take Bounty from him and ordered the anchor cable to be cut without the guests on board knowing. Although a few jumped off when they realized what was happening, and six other rather ancient women were sent ashore at Moorea, six Polynesian men (three of which were stowaways), twelve Polynesian women and a baby girl (Sully) were to continue the journey to their unknown home. December 1787 HMAV Bounty, under the command of William Bligh, sails from Spithead in England. Her mission is to collect breadfruit from Tahiti to be taken to the West Indies to feed slaves on plantations there. March 1788 Fletcher Christian, masters mate of the Bounty, is promoted to acting Second Lieutenant. October 26, 1788 HMAV Bounty arrives at Tahiti. It will be at the island for 5 ½ months. April 28, 1789 Under Fletcher Christians leadership, many of the Bountys sailors mutiny and cast Captain Bligh with 18 sailors loyal to him adrift in the ships cutter. May 1789 The Bounty, with the mutineers sailing her, arrives at Tubuai, but leaves after just three days at the island. June 6, 1789 Returning to Tahiti, the Bounty takes aboard a number of Polynesian men, women, and a baby. Livestock is also put aboard. June 23, 1789 With its mutineer crew and Polynesians aboard, the Bounty returns to Tubuai. September 22, 1789 The Bounty returns to Tahiti again. A decision is made to search for a safe hiding place. A total of 16 of the mutineers decide to take their chances at safety at Tahiti. Nine others, along with six Polynesian men, 12 women, and a baby girl set sail to seek a safe haven. January 1790 Pitcairn Island is sighted. After inspection of the island by Christian it is decided to settle there. A factor in the decision is that the island has been misplaced on Admiralty maps and would thus be hard to find. January 23, 1790 Whether by plan or by accident, HMAV Bounty is set afire. The unburned portion of the ship sinks in what is now called Bounty Bay. 1790 Two of the Polynesian women brought to the island - Puarei and Tinafanaea - die. Two Polynesian men - Oha and Tararo - are murdered. September 1793 In one day four of the mutineers - Fletcher Christian, John Mills, Isaac Martin, John Williams - are killed by Polynesian men. 1798 Drunk on a locally distilled brew, mutineer William McCoy commits suicide. 1799 Mutineers Edward Young and John Adams, believing their lives are in danger from the man, kill mutineer Matthew Quintal. December 1800 When Edward Young dies on Christmas Day, John Adams becomes the last of the mutineers alive on Pitcairn Island. February 6, 1808 Pitcairn is re-discovered along with the mutineers presence on the island by Captain Mayhew Folger of the American sealing ship Topaz. September 17, 1814 HMS Briton and HMS Tagus unexpectedly call at Pitcairn. Captains of the ships correct the calendar error made when the Bounty crossed the international date line. March 5, 1829 John Adams, last of the mutineers on Pitcairn, dies. He is 65 years old. His wife, Teio (Mary) follows him in death nine days later. March 1831 The people of Pitcairn move to Tahiti for resettlement. Disease strikes quickly with death felling 12 of the Pitcairners, including Fletchers eldest son, Thursday October Christian. The people decide to return to their Pitcairn home. June 1856 The Pitcairners - all 193 of them  immigrate to Norfolk Island - in the ship Morayshire. A baby is born during the voyage. 1859 Homesick for Pitcairn, 16 of the Pitcairners are brought back to the island in the Mary Ann. 1864 Four more families return to Pitcairn from Norfolk. 1886 After learning the tenets of the faith, most of the Pitcairn people embrace the Seventh-day Adventist faith, setting aside the Church of England faith they had embraced from earlier times. 1890 The missionary schooner Pitcairn, with Adventist missionaries who would carry their faith to many islands of the Pacific aboard. Most of the adults on Pitcairn are baptized, formally making them members of the Adventist faith. 1914 Pitcairn becomes a stopping point on the direct Panama to New Zealand shipping route when the Panama Canal opens. 1940 The first issue of Pitcairn Islands stamps. Income from the world-wide sale of these popular postal adhesives will begin to fund operations and provide subsidies for Pitcairn and her people. 1957 An anchor of HMAV Bounty is raised from Bounty Bay, Pitcairn Island. January 1990 Celebrations marking the bicentennial of the settlement of Pitcairn are held. January 8, 1999 What could be the last of the few cannons that were aboard HMAV Bounty is raised from the wreck site. --Adapted with permission from Guide to Pitcairn, available from the Study Center Store. After fleeing Tahiti, Bounty sailed westward combing the Cooks, Tonga and the eastern islands of Fiji in search of a home. This was to be a journey that would take almost four months. During 1956, Professor H. E. Maude of the Australian National University, upon finding newspaper articles from the 1820's containing interviews with Teehuteatuaonoa (consort of the mutineer Isaac Martin), came to the conclusion that Bounty was the first European vessel to sight Rarotonga, and for some time fruit juice was the islands main export. Professor Maudes findings were supported by comments made by John Adams and stories, current amongst the Cook Islanders, of a visit by a floating garden with two waterfalls (Bounty would have looked like a garden and the waterfalls might well have been referring to the pumps aboard) at Rarotonga, around the same time of Bountys voyage. Having stumbled upon or recalled Carterets account, Christian sailed eastward in search of Pitcairn Island. Reaching the spot where the island supposedly was, there was nothing but water. Guessing that Carteret had marked the longitude incorrectly, Christian zigzagged along the line of latitude and Pitcairn was sighted on the evening of 15 January 1790. The violent swell made it impossible to make a safe landing at the island. After waiting two to three days for the weather conditions to subside, Christian, Brown, Williams, McCoy and three Tahitians rowed ashore at Tedside. The island was lonely, inaccessible, uninhabited, fertile and warm; it exceeded Christians highest hopes. While Bounty was anchored in what is now known as Bounty Bay, livestock and goods were shipped ashore. Then, fearing that if any European vessel sighted the ship, retribution would inevitably follow, the mutineers ran Bounty ashore and on 23 January 1790, the ship burned and sank. It is possible that Quintal, being over anxious about discovery, was responsible for the fire. In an article published in 1819, Teehuteatuaonoa (known as Jenny, consort of Isaac Martin) says that Fletcher Christian wanted to preserve the ship, but Matt said No, we shall be discovered, so they burnt her. Sydney Gazette and New South Wales Advertiser, Saturday, 17 July 1819. On arrival, the mutineers constructed rough leaf shelters, in what is known as Adamstown, where the community of Pitcairn lives today. These shelters were later replaced by more durable houses. They found the breadfruit there and planted sweet potatoes and yams with seeds they had brought with them. The land was divided among the mutineers only, and the Polynesian men were allocated none. Furthermore, the six Polynesian men were treated as slaves and because there were three more men than women, it was they who had to share wives. During the first year on the island, the consorts of John Williams and John Adams died and Titahiti, Tararo and Ohas women, Toofaiti (Nancy) and Tinafanaea, were taken and given to the two mutineers. Titahiti, Tararo and Oha reacted by conspiring to kill the mutineers, but the women betrayed them by informing the mutineers of their plan. This led to the deaths of Tararo (Toofaitis consort) and Oha during December 1790. Meanwhile, on January 8, 1791, HMS Pandora set sail for Tahiti on a mission to capture the mutineers. Before reaching Tahiti, Pandora discovered Ducie Island and, although Pitcairn was not sighted, the ship passed close to the island. At Tahiti, the fourteen captured Bounty men were imprisoned in a dark cage, known as Pandoras Box. When Pandora struck Australias Great Barrier Reef, all except one prisoner were released from the shackles. Four of the Bounty men drowned, along with 31 of Pandoras crew. Unsuccessful searches for the wreck of the Pandora were made during the late 1960s and early 1970s. Then finally in 1977, the wreck was discovered and is currently being excavated for display in Townsville, Queensland, Australia. By September 1793, several children had been born on the island. The four remaining Polynesian men now shared one woman (Mareva). Having suffered enough from their ill treatment, the Polynesian men set out to kill the mutineers. John Williams was the first victim, followed by Fletcher Christian, John Mills, Isaac Martin and William Brown. John Adams was shot, but survived. The Polynesian men then began fighting over the women. Teimua was shot dead by Manarii, then Manarii himself was shot by William McCoy and Matthew Quintal. One of the women, possibly Teraura, killed Tatahiti and Edward Young shot Niau. None of the six Polynesian men left behind any children. Four European men remained: Edward Young, Matthew Quintal, John Adams and William McCoy, along with ten women and their children. The following four to five years were peaceful except for occasional outbreaks by the women, protesting against their treatment by the men, including an attempt to leave the island. Gradually, the men and women became reconciled to their lives and to each other, and all might have remained harmonious had not McCoy, who had once worked in a distillery, discovered how to brew a potent spirit from the roots of the ti plant (Cordyline terminalis). McCoy, losing control mentally, tied his own hands and feet and threw himself into the sea, where he drowned. In 1799, a drunken and threatening Matthew Quintal was put to death by Edward Young and John Adams. Before the educated Edward Young died of asthma in December 1800, he used Bountys Bible and Prayer Book to improve Adams reading and writing abilities. Ten years after arriving at Pitcairn, Adams was the sole male survivor of the original settlers. After Youngs death, John Adams filled his days drinking the potent spirit distilled from the ti plant. Then one night, after having a dramatic hallucination, Adams underwent a transformation and became fervently religious. As leader of the community, Adams began to take his responsibility seriously. He led Sunday services and, to ensure the communitys well being, Adams saw to it that the young people cultivated the land and cared for the stock. The women played an important role in ensuring the survival of the island and even more so after the massacre. Only they could have known how best to tend gardens, catch fish and make traditional tools and canoes. They would also have had almost sole influence on the up bringing of the children. The women had brought their own utensils from Tahiti and these were handed down from mother to daughter. The men had landed tools and other implements from Bounty and fashioned more as necessary. Food cooked in Polynesian stone-lined ovens, consisting mainly of yams, taro and bananas with coconut cream and an occasional pig, bird or goat was, in Polynesian style, served twice a day, at noon and nightfall. Clothes, first made from sail cloth from Bounty, were replaced by loin cloths and skirts of tapa, the traditional Polynesian fibre-cloth, beaten from the bark of the paper mulberry tree. According to Teehuteatuaonoa (Jenny), wife of mutineer Isaac Martin, a ship was sighted off Pitcairn after Fletcher Christians death (1793) and before Matthew Quintals death (1799). Some time later, a second ship appeared and some sailors came ashore to collect coconuts. Although she says they tried beckoning to the ship to send another boat ashore, the ship sailed off without knowing the island was inhabited. Topaz, an American whaling ship, came across Pitcairn Island on 6 February 1808 and discovered the community. Captain Mayhew Folger sent news of his findings back to England, but the country was preoccupied with the Napoleonic Wars and there was little interest. Again, the islands existence appeared to have been ignored. Two ships, Briton and Tagus, which were hunting for an American man-of-war, Essex, rediscovered the island and its community on 17 September 1814. Both Captain Sir Thomas Staines (Briton) and Captain Pipon (Tagus), had no knowledge of Folgers previous report. Charmed by the physique and simplicity of the islanders, and favourably impressed by John Adams and the example he set, they agreed it would be an act of cruelty and inhumanity to arrest him. Twenty-five years of isolation had ended. News of the island community attracted great attention around the world and increasing visits were made by ships sailing from India and Australia to South America or to England via the Horn. The reports sailors brought back stimulated an interest. English missionary societies sent gifts of Bibles, prayer books and spelling books to the island, as well as such practical necessities as crockery, razors, tools and guns. In addition, nearly every visiting ship made generous gifts and bartered surplus stores for provisions, and it was at this time that the orange was introduced, that houses were improved with the aid of saws and planes, and clothes and living became more European in character. As he grew old, John Adams was finding it difficult to care for his wife Teio (Mary), who was now blind, and to cope with educating the increasing number of children. He worried about the future and his appeals to the British Government and missionary societies for a successor to educate the children were unsuccessful. In December 1823, the British whaler Cyrus, arrived at Pitcairn. John Buffett, a shipwright from Bristol, England, took pity on Adams and requested permission from Captain John Hall to remain on the island. Buffett was given permission to stay, however, his friend, John Evans, was not. Evans jumped ship and hid until Cyrus departed. Both men were accepted into the community and extended the islands genetic pool through being the first non-Bounty, non-Polynesian settlers. Buffett married Dolly Young soon after arriving, and John Evans married John Adams daughter, Rachel. As well as teaching the children and conducting church services, Buffett taught the islanders woodworking skills, which later became the basis for Pitcairns main industry. The population had now risen to 66 from the 35 of 17 years earlier. Adams, believing the land was yielding less, seeing the supply of timber decreasing and concerned that the erratic water supply would be insufficient for the growing population, sought the communitys removal to Australia. In November 1828, the well-educated George Hunn Nobbs arrived at the island. Nobbs, allegedly the illegitimate son of a marquess, had served in both the British and Chilean navies. He was a strong character and soon ousted Buffett from the role of schoolteacher and pastor. On 5 March 1829, John Adams passed away at the age of 65, to be followed by his wife (Teio) nine days later. He left behind a community which, though it originated in mutiny and had suffered misery and murder, was to form the basis of countless Victorian sermons. The dramatic regeneration was largely Adams work, and he was mourned as Father, the name by which he had been known to every member of the community. In London, John Adams request for emigration was being sympathetically supported and, although a visit by Captain Waldegrave in 1830 discovered that the community was not in necessitous circumstances or anxious to leave the island, it was too late to stop the decision of emigration. On 28 February 1831, HMS Comet and the Colonial Barque Lucy Anne arrived from Sydney with instructions to remove the community to Tahiti. 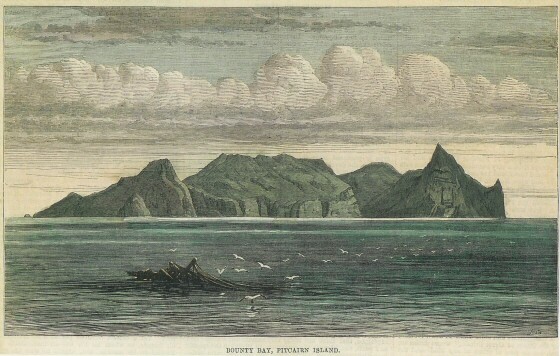 After much persuasive discussion with inhabitants, who were reluctant to leave the island, the entire community departed Pitcairn on 6 March 1831 on Lucy Anne, arriving at Tahiti on 21 March. Queen Pomare IV and her people treated the Pitcairn Islanders with great generosity and kindness. Land was made available for the islanders to build their own homes and a large house was made available for their temporary accommodation in Papeete. The Pitcairners, however, did not feel at home and could not adjust to this different way of life. They had become on the one hand too European in their ways and, on the other, stricter in morals and sexual behaviour than their hosts. They longed to return to their own habits in their own island, all the more so when infectious diseases, to which they had little immunity, began to kill them. On 21 April, within a month of arrival in Tahiti, Thursday October Christian I, the son of Fletcher Christian, the first child born on Pitcairn, died. His death was followed by the youngest, Lucy Anne Quintal; and during the next two months there were 10 more deaths and only a single birth. Attempts to arrange for their return to Pitcairn failed, until Captain William Driver of the Salem whaler Charles Doggett arrived at Papeete and offered to take the remaining 65 back to their island home for $500. A subscription was immediately organized by the local community; the Pitcairn Islanders, anxious to return, contributed to this by selling blankets and other necessities. Captain Driver sailed with them from Papeete on 14 August 1831, and reached Pitcairn on 3 September. Inevitably, the little community had lost some of its innocence. It was leaderless too, for Nobbs had not been accepted as Adams successor, and they could not agree on a local head. There was a period of anarchy and drunkenness but the vacuum was soon filled. In October 1832, a puritanical busybody, by the name of Joshua Hill, landed on the island, claiming to have been sent by the British Government. He was welcomed and, supplanting Nobbs as pastor and teacher, at once appointed himself as President of the Commonwealth of Pitcairn. Hill abolished the distilling of liquor and introduced arbitrary imprisonment and other severe punishments for the smallest misdeeds. He secured the expulsion of Nobbs and the other lousy foreigners, Buffett and Evans, who formed an intimidated opposition.
. . . Moreover, John Buffett, the sentence of the court, is, that whether with or without your family, you are to leave the island by the first vessel that may present herself thus; for if you do not, punishment and imprisonment will be the consequence. McLoughlin, D.
However, their departure caused a reaction and Hills power gradually declined until, in 1838, his fraudulent claim to represent the British Government was exposed. Hill was forcibly removed from the island and taken to Valparaiso by Captain Bruce of HMS Imogene. Upon receiving a message requesting he return home, Nobbs returned from exile and, by a general vote, was reinstated as pastor and teacher. One has only to read Hills literary effusions to surmise that he was probably mentally unstable throughout his six years on Pitcairn. Their experience with Joshua Hill and increasing visits by American whalers brought the islanders to recognize their need for protection, and they prevailed upon Captain Elliott of HMS Fly to draw up a brief constitution and a code of laws selected from those already in force. A Magistrate (who must be native-born) was to be elected annually by the free votes of every native born on the island, male or female, who shall have attained the age of eighteen years; or of persons who shall have resided five years on the island. He was to be assisted by a Council of two members, one elected and one chosen by himself. No only was this the first time female suffrage was written into a British constitution but it also incorporated compulsory schooling for the first time in any British legislation. Whatever the precise legal significance of Captain Elliotts action, the Pitcairn Islanders date their formal incorporation into the Empire from 30 November 1838, when the new constitution was signed onboard Fly. That they also became a British Settlement later under the British Settlements Act of 1887 is of no consequence to them! The next decade was peaceful and uneventful, although in 1845 the worst storm in the islands history destroyed many coconut palms, bananas, yams and boats. Periodic epidemics of influenza; accidents recorded in place names such as Where-Tom-Off; and births, marriages and deaths alone disturbed the placid life. The population topped the 100 mark. Nobbs was firmly in control, Buffett taught the young men navigation, carpentry, and how to fashion curios of the kind still made from miro and other local woods. Their curios, together with hats and baskets made by the women by traditional methods from the leaves of the Pandanus Palm, found a ready sale amongst the passengers and crews of visiting vessels. Adapting themselves to the need of their seafaring visitors, the islanders became skilled market gardeners, producing potatoes, yams, coconuts, bananas, oranges, limes, and chickens, for which they accepted in return clothing, tools and money. And largely because they sold their products for fixed prices, they acquired a reputation for strict honesty. Inevitably, the islanders language, clothes and ways grew more European with these contacts, but Polynesian customs were not entirely swamped, and the traditional pastimes of kite flying, stilt walking and surf riding still occupied many of their leisure hours. By 1850 the population was 156 and increasing rapidly. Their friends in England and the Pacific were again discussing the question of emigration, for it was feared that land would soon become insufficient, and fish had deserted the coastal waters since the landslides caused by the great storm of 1845. After their experiences in Tahiti, the islanders insisted that if they were compelled to emigrate it should be to an uninhabited island. After examining several possibilities, the majority of the community decided to move, with British Government aid, to Norfolk Island. It had much to recommend it. It was larger than Pitcairn and now inhabited, but 60 years of convict labour had left hundreds of acres under cultivation. The island was well stocked with domestic animals and there were roads and houses. In 1856, when the naval transport Morayshire arrived, all 193 islanders boarded her. A son, Reuben Denison Christian, was born to Isaac and Miriam Christian during the voyage, bringing the population to 194. This might have been the end of the Pitcairn story, but in spite of the advantages of Norfolk, many of the islanders wanted nothing more than to return home. By this time, no matter who was elected Chief Magistrate, the real leader of the community was George Nobbs, who had been ordained a priest in the Church of England in 1852 and who lived on, at Norfolk, until 1884. Through twenty years of selfless service as spiritual mentor and secular teacher, he had won affection and trust in his adopted home. Had he opposed migration to Norfolk, few of the others would have gone; but not even his arguments against the return to Pitcairn could conquer nostalgia. Late in 1858, an opportunity to return home arose when Mary Ann, en route to Tahiti, offered passages, and 16 of the islanders led by Moses and Mayhew Young boarded her. Those who chose to stay behind, voted to pay the costs of the journey from communal funds. The islanders returned to find some of their homes vandalised, and there was evidence of shipwrecked sailors having been on the island. It was later discovered that these sailors were from Wild Wave, that had been wrecked on the reef at Oeno Island. Gardens were overgrown, cattle and other domestic animals were running wild and John Adams grave-marker was missing. They arrived home in time to stop the French, who thought the island was abandoned, from annexing their home. The original John Adams grave-marker is now in the National Maritime Museum in Greenwich, England. In 1864, a second group from Norfolk Island returned home to Pitcairn on the ship St. Kilda. Along with the returning Pitcairners was Samuel Warren, of Rhode Island in America. Samuel Warren had married Agnes Christian, daughter of Thursday October II and Mary (Polly) Christian, just prior to their departure from Norfolk. During the journey, one of Thursday October II and Marys children died. It was a different Pitcairn now of 43 people and only five families - the Youngs, Christians, McCoys, Buffetts and the American Warrens. Of these the male lines of the McCoys and Buffetts were to die out. These settlers knew from past experience how to make the best use of their resources, but materially they were probably worse off than the mutineers. They had no sail cloth to turn into clothing, no means of lighting their make-shift homes other than by candlenut, and far fewer visiting ships from which to obtain goods. The peak period of whaling in those latitudes had passed, and compared with the 40 ships a year that called 20 years previously there were now only about a dozen. The occasional vessel that did stop, was most likely to be a steamer carrying passengers. The islanders therefore turned Buffetts wood carving lessons to advantage by selling them curios in place of the food they had sold to the whaling crews. Their limited resources were fortunately supplemented by a succession of shipwrecks, which brought them a new bounty from the outside world. The community fed and clothed the shipwrecked sailors who, after they returned home to relate their adventure, rewarded their rescuers with gifts of crockery, clothes, flour, books and even an organ. Renewed visits by men-of-war in the Pacific also revived the traditional English interest in the children of the Bounty mutineers. Queen Victoria sent another organ as a personal gift in appreciation of the islanders domestic virtues; and a Liverpool firm tried to arouse interest in the commercial production of cotton, arrowroot and candlenut oil. As Nobbs had planned, Simon Young took over the work of pastor and schoolteacher, and the former system of government by a Magistrate and two councillors was re-introduced. Almost the first communal task was the construction of a combined school and church, but, with this, repairs to houses, and the replanting of gardens, there was no energy left, and much of the island reverted to natural bush. In 1868, some of the Norfolk Island settlers, including old John Buffett, who was to live to the ripe old age of 93, visited Pitcairn and urged their relatives to rejoin their now wealthier community. But nothing happened except that occasional visits between the two settlements have continued, desultorily, until today. New blood brought new ways and ideas to the tight little society, but one of the new-comers fell in love with a girl who was, unfortunately, already engaged to a Christian. Strong passions were aroused and the Commander of the visiting HMS Sappho was induced to approve a law forbidding strangers to settle on Pitcairn. The law was later amended but only to permit settlement by those whose presence was considered of benefit to the island. From the days of John Adams, the islanders had been staunch adherents to the Church of England. They read and studied the Bible, which was for many of them their only reading matter, and its texts were truth. Not unnaturally therefore, they read with increasing interest the contents of a box of Seventh-day Adventist literature sent to them from the United States in 1876. A decade later, on the 18th October 1886, Mr. John Tay, a missionary of the Seventh-day Adventist Church, arrived at the island and, by unanimous vote, was allowed to stay and argue his cause. The result was recorded in Mary McCoys diary in March 1887: The forms and prayers of the Church of England laid aside. During the past week meetings were held to organise our church service on Sabbath. So Saturday again became the day of rest, as it had been until 1814 when Fletcher Christians omission to correct the time across the date line was rectified. Conversion was greeted with great pleasure by the Seventh-day Adventists in America and they raised funds for a missionary ship, which sailed for Pitcairn in 1890. The islanders were baptized in one of the rock-bound coastal pools, and the pigs were killed to remove the temptation of eating pork. But few other changes were needed: all were already total abstainers, most were vegetarian, except for occasional meals of goat, which is not forbidden by Adventist discipline, and few smoked. The Missionaries relieved the ageing Simon Young in the school and, energetically, introduced history, grammar, cooking and nursing. They began a newspaper and a kindergarten and opened a public park. Thus stirred by example, the islanders began to question their social inertia and, putting it down to weakness in their leaders, asked Captain Rooke of HMS Champion, who arrived on 3 October 1892, to reorganise their system of government. An elected Parliament of seven was introduced and executive and judicial functions were separated. The legal code was also revised to create penalties for, amongst other things, adultery, wife beating, cruelty and Peeping Toms; and the system of public work of pre-migration days was restored. Society was a long way, indeed, from the simple order of Adams! Any person who shall call out Sail Ho when no ship is in sight shall be liable to a fine not exceeding five shillings. Pitcairn Island Government Regulations, 1940, Part VI - Offences. The former law providing for the imprisonment of dogs for chasing cats was also altered by substituting the penalty of death for that of imprisonment, for the offending dog. Law and Order in Pitcairn island (1791 - 1971) by Donald McLoughlin, B.A., LLB. But the reports of the naval officers who visited Pitcairn towards the end of the nineteenth century still continued to reveal how society had deteriorated since the return from Norfolk Island. There was lawlessness and a lack of unity and purpose; and, in 1897, murder. That the community did not degenerate still further was due largely to the influence of James Russell McCoy, a great-grandson of the mutineer. In 1870, at the age of 25, McCoy had been elected Magistrate and during the next 37 years he was chief executive no less than 22 times. Although island-born, McCoy had spent some time both in London and Liverpool and, autocrat though he was, he was also, in a real sense, a link between the old Pitcairn and the new. By the turn of the century he had restored purpose to the community by enforcing the recently revived laws of public work: and his personal courage and example, which won him respect if not popularity, secured improvement until he began to spend much of his time overseas on missionary work. In 1904, Mr. R. T. Simons, the British Consul at Tahiti, paid his first visit to Pitcairn and found the parliamentary system too cumbersome for the small community. He reintroduced the time-honored post of Chief Magistrate and two committees to take charge of internal and external (that is marine) affairs. All the posts were made subject to election and an additional office of Secretary-Treasurer was created. What was more, the days of representation without taxation were ended: an annual licence fee for the possession of firearms was introduced which, until 1968, when motor vehicle licences were introduced, was Pitcairns only tax. With some amendment Simons constitution and code stood the test of time, until in 1940 Mr. H. E. Maude, representing the British High Commission in Fiji, consolidated and expanded them. The twentieth century brought an end to European rivalry in the Pacific and naval visits gradually diminished. Fortunately the Mission ship Pitcairn and her successors maintained contact with Tahiti and merchantmen again began to call with increasing frequency until, in 1914, the opening of the Panama Canal placed Pitcairn on the direct run to New Zealand. Many of the new visitors were liners carrying hundreds of passengers anxious to have mementoes of the island: This halfway rock in the longest regular service in the world. A ship a week, and Pitcairns isolation was over! The pattern of live changed, inevitably. More and more men developed an urge to see the world, which money and the visiting ships made possible, and communities grew up in Wellington and Auckland from where some moved on to Australia. But even so, the public economy of Pitcairn languished and it was not until postage stamps were issued in 1940 that the island was able to afford some of the public amenities taken for granted in other parts of the world.